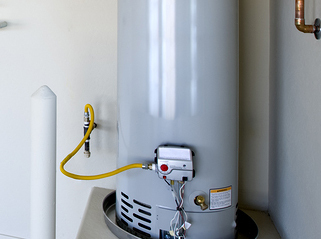 Water heaters provide hot water by heating elements inside the tank and increasing the temperature of the water within the tank. When the tank thermostat senses cold water entering the tank, it signals the heating elements to turn on and heat the cold water. This process happens each time you use your hot water. If one of the heating elements break or the thermostat stops working the water heat stops heating water and when you turn on the faucet for hot water, you’ll only receive cold. If you’ve turned on your water expecting hot and got cold instead, give our Water Heater Service in Apache Junction a call. Even if you don’t know how your water heater works; we do. We keep heating elements and thermostats on hand during our same day water heater consultations so we can repair your water heater and help you get on with life without having to wait on a repairman to bring the correct part during a second visit to your home. If your unit requires more than maintenance we’ve got that covered as well. Our highly experienced team of licensed professionals will help you choose a new water heater and replace your broken one quickly and efficiently. Hot water on demand is one of the best accomplishments of modern living. Let our Water Heater Service in Apache Junction keep your water heater running smoothly and dependably: we would be honored to come to your home to inspect your heating unit and offer preventative maintenance so you don’t have to wonder if today will be the day your water heater stops heating water. Let us give you the confidence and security of knowing your family will always have the hot water they need when they need it. Call us today for a free quote!